This is definitely going to be my new favorite for a while, and it would look absolutely beautiful on my PS4! Would it be possible for this to be available on the console in the future?? 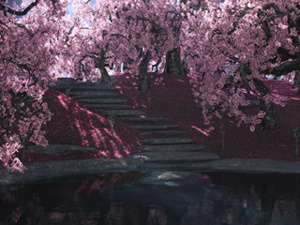 Simply beautiful, it reminds me of my time in Japan, love it, Great Render my friend. Really like the new version, can't wait for a multiscreen take. Oh yes, this one is much better than the previous one that is now in the pickle jar. More balanced in color and textures. Love this one! Can't wait for dual screen! The multiscreen is rendering now and I will use that to source a new 21:9. Glad you guys like the new version!! LOVE this render, and the brightness of the water and trees. The darker backgrounds are okay, but I've always trended toward your brighter ones (beaches, big sky, etc. ), and so I love that you brightened this one up! Can't wait for the multi-screen! I love the looks of this image, Ryan, but the 3440x1440 version has too much of the water cut off and we don't see as much of the vibrant blues that (to me) make this image so attractive. Completely awsome. maybe a little more sun on the water. light it all up. But still one of the best in a long time. Again. I really can't make either version my favourite. The new version is my favorite of the two. I love your spring renders! I received the update email last night and immediately exclaimed, "Holy #$%^!" The pickle jar version reminds me of seclusion, but this version is spectacular and feels very open. This version really reminds me of how the Kenrokuen garden in Kanazawa, Japan feels like. Comparing this to the pickle jar version, the water and sky are much more vivid in this newer version. Looks like a hidden treasure to have a picnic. The newer version is definitely my favorite. So peaceful. I liked the original and didn't think it needed to change like some commenters, but now that I see this version, i see what they mean - This one really nails it, great job! When I received the email of your latest render, I opened it and instantly said "wow"... what a beautiful image. Thank you so much. My whole life has been involved with Military or Tactical. When away from the job, we all seek a peaceful home lifestyle. This image has a very "Zen" like quality to it, very peaceful to look at. The reason why I have followed you all these years is because of that very thing: your imagery always makes a statement, has something to invoke in the mind that is well, nice. I hope you hang around a loooong time. Your talent is really one of a kind. I don't always agree with your choices when you decide to do a second rendering, but in this case, the second greatly surpasses the version in the pickle jar. As much as it may have seemed cliche to have green grass, this design really needed that contrast. The brighter rander also adds a lyrical quality to it, that the earlier one lacked. WOW! This is one of your very best - and I have been watching you for years now! I love it! The only suggestion is it needs some large Japanese goldfish in the water! I agree with others I liked the other version of this, but I really, really like this one. I love that we can see the picture even better and it really is Spring like. Great job!!! I liked the previous version, but I *really* like the sun rays and green grass in this version. Much more natural feel. Almost expect to see kami sitting in the trees! The other one came out a little too monochromatic, but this one is breathtaking. I wanted to like the other one, but something was off. This one is great. perfect. I like the original but I LOVE the updated version! This version is MUCH better that the first version. Color really makes it. Not that the first version was bad, but the water is far better in this version. Love it. This is much more "DB' than the first. The new version of Vue has a weird tendancy to render my 8K renders with different atmospheric settings than the 1080p preview renders. This has caused a bit of a slowdown in my workflow as I get it figured out. Thanks for your patience! This one is great. Will there eventually be multi-screen renders? I love formal Japanese gardens (Like the one in Portland, Oregon). This image has a nice painterly quality that I really love. The restricted color palette contributes to that sense and I like it! Just a tad too much purple. Otherwise very nice. I was hoping you'd do another Spring render, and you sure didn't disappoint. This is just so beautiful. Thanks and great job Ryan!!! I actually took all the grass out from my first version and went with just flowers. Sorry you don't like it. I like this one but I would suggest one small change. Maybe just a little less purple on the grass.